PITTSBURGH (AP) — Josh Smith spent the first three innings of his career as a major league pitcher working his way into trouble before deftly working out of it. In the fourth, he wasn’t quite so lucky. The Pittsburgh Pirates chased the Cincinnati rookie and then added on against Pedro Villarreal to hand the Reds a 7-6 loss on Tuesday night. Smith, called up from Triple-A Louisville to give ace Johnny Cueto’s aching right elbow a breather, lasted just three-plus innings, walking six and striking out three. The 27-year-old will stick with the Reds for the rest of the road trip. He only hopes his second start goes better than his first. The career minor leaguer walked the bases loaded in the first and escape. He added walks in the second and third before things quickly unraveled in the fourth, when Pittsburgh needed just four batters to erase a 4-0 deficit. Pedro Alvarez’s RBI-double put Pittsburgh on the board and Francisco Cervelli hit a three-run shot to tie the game. Andrew McCutchen followed minutes later with a two-run shot off Villarreal (0-2) as the Pirates ended a three-game losing streak. Rob Scahill (2-3) earned the win in relief of ineffective starter Jeff Locke. Mark Melancon worked a perfect ninth to pick up his major league-leading 24th save. 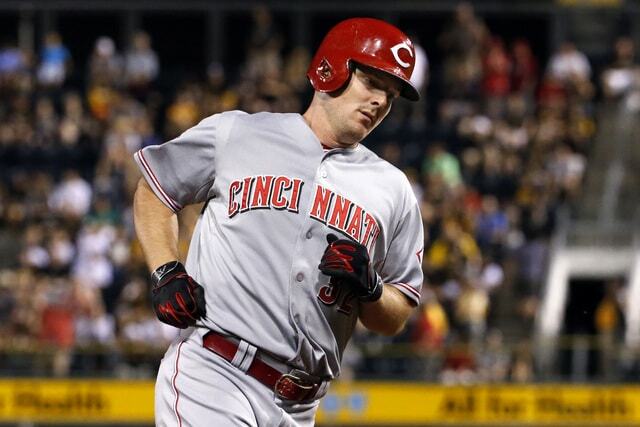 Jay Bruce homered and drove in three runs for the Reds. Cincinnati left 12 men on base and went just 4 for 17 with runners in scoring position. It also helped erase a shaky start by Locke, who gave up four runs in four innings. Some spotty defense behind him didn’t help, though it could have been worse. The Reds left seven runners on with Locke on the mound. Scahill wasn’t much better but Pittsburgh’s bullpen managed to slog the rest of the way, retiring eight of the last nine Cincinnati batters on strikeouts as the Pirates recovered from an ugly sweep in Washington over the weekend — including getting no-hit by Max Scherzer — to win their seventh straight home game. The Reds threw out Pittsburgh’s Gregory Polanco at second base twice on attempted steals, with both outs coming following a replay challenge. The second came after shortstop Brandon Phillips kept the tag on Polanco when Polanco briefly popped off the base. Reds: Price said Cueto — who is 18-4 with a 2.13 ERA against the Pirates — could have pitched but the team felt its ace would benefit from a few extra days off to give right elbow a little more time to rest. “He’s not feeling like he has his maximum amount of strength, so we’re just trying to build that up right now,” Price said. “It just makes sense for us right now.” Cueto’s next scheduled start is Friday against the New York Mets. … Rookie RHP Raisel Iglesias (strained left oblique) and LHP Tony Cingrani (strained left shoulder) are both on track to return before the All-Star break. Pirates: Top pitching prospect Jameson Taillon is out indefinitely with what general manager Neal Huntington described as lower abdominal discomfort. Taillon, the team’s top pick in the 2010 first-year player draft, is recovering from Tommy John surgery in his right elbow. He was scheduled to start in the Gulf Coast League on Tuesday. The series continues on Wednesday when Cincinnati’s Mike Leake (4-4, 4.01 ERA) faces Pittsburgh’s Gerrit Cole (11-2, 1.78 ERA). Cole leads the majors in victories and has won each of his last six starts but is 0-2 with a 4.70 ERA in four career starts against the Reds, including a 3-0 loss to Leake on May 6. Leake is 7-3 with a 3.10 ERA in 22 starts against Pittsburgh, including a 2-3 mark at PNC Park. Leake is coming off seven shutout innings in a win over Miami last Friday.